Hi, My name is Claudia Conly owner of Dannys Jewelry, we strive to create unique, quality, wearable, jewelry, and have been working at our craft for 35 years. Our staff has studied at the Geological Institute of America, and The Revere Academy in San Francisco. I manage our American Indian jewelry store and jewelry of Dannys design. 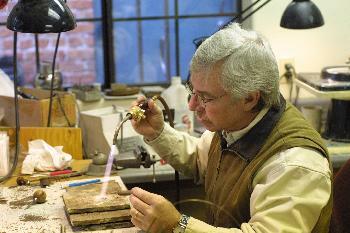 My youngest son Steve works in Dannys Jewelry with me making the rings you see on our site. My son Ian owns a fine jewelry store located in the same building, also helping make jewelry for Dannys. Our studio and jewelry store is located in a small western town, Wickenburg Arizona ( N.W. of Phoenix). It was at one time the "dude ranch capital of the west". We hand make each piece of jewelry ourself, using gold hand fabrication skills, lost wax casting methods, as well as stone inlay arts. We work in 14 K yellow and white gold, and use platinum heads to hold the diamonds. Give us a call on my toll free direct telephone line, and we will work with you to create a piece of jewelry that is special to you. We will also give you our satisfaction guarantee, We will not forget you after the sale, many of my customers return time and again for additional pieces to add to their collection. Danny's Jewelry Is located in Danny's Mercado 301 East 1700 South, Salt Lake City, Utah 84115. Our Guarantee If within two weeks From the time of receipt of the jewelry I have created for you, you are not satisfied, and upon the return of said merchandise in new condition, I will refund your purchase price less the shipping and insurance charge. I will replace turquoise that has come out of my jewelry due to normal wear for free up to 3 years, after that there will be a small charge, I require you to cover the shipping and insurance for its return to you, usually $30.00 in U.S. for U.P.S. overnight and starting at $80.00 for Canada overight. I make your ring by the size you give me, should the ring need to be re-sized, I will charge approximately $100.00 (depending on the complexity of the ring) plus return shipping and insurance. To size my rings all the turquoise has to be removed, the ring sized, and then re inlayed. We have been in business for over 34 years and am dedicated to providing the best product I can. Should a problem arise, feel free to call me I am sure we can work together to resolve it. Common questions with answers on our detail page. Most of my customers give me a call on my toll free number and discuss their wishes with me. When they get ready to place an order they will give me their shipping address, their phone number, and a credit card number. I will at that time give you a ship date.....When I complete your jewelry, I will give you a call and run your credit card at that time. I ship UPS Overnight. When you receive your new ring give me a call and let me know how it fits and if there are any adjustments that need to be made. You can also send me a certified check in the mail if you wish. call me directly, it is still the best means of communication.